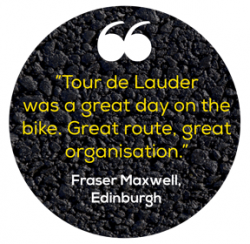 Tour de Lauder raises money for the Steve Cully Tribute Fund and Chest Heart & Stroke Scotland. So far over £200,000 has been raised for the Steve Cully Fund at Chest Heart & Stroke Scotland since 2012, which is an incredible legacy for Steve and has helped provide vital support for those affected by heart conditions in Scotland. Or alternatively click here to donate to the main online sponsorship page for the 2019 event. Thanks very much. Everyone's support and generosity is very much appreciated and bring on the 27th of April.